International orders: $12.00. Please pay in US funds. International money order, cash, cheque, or Paypal. Kaie Kellough is a celebrated African Canadian poet born in Vancouver; based in Montreal - creating pure spoken word experiments with the sonic backing of Montreal's most powerful roots ensemble: The Kalmunity Vibe Collective. 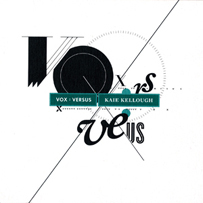 Vox : Versus is a series of duets, of conversations between poem and music, voice and instrument. Language is dis-assembled; music dis-integrated - put back together on a new sonic plane. Recorded at Hotel 2 Tango. Mastered by Harris Newman. Beautifully packaged in a six panel cardboard sleeve, Vox : Versus includes full liner notes and overview on the background of the project, including recording notes and session photographs. Vox : Versus has been #1 on the CKUT Montreal top 30 main chart. BIO Né in the way out west, Kaie Kellough has been based in Montréal since '98. He is a bilingual author, editor, educator; and general word-sound systemizer. His bop-inflected vox and text syncopate Canada's solitudes. Kaie has dubbed and inked his way from c to c, b.c. to q.c., n.s. to the u.s.
Kaie's latest book is Maple Leaf Rag (poetry, arbeiter ring publishing, april '10). He is the author of lettricity (cumulus press, '04) and co-editor of The Talking Book Anthology (cumulus press, '06). He was writer in residence for the '05 Toronto Int'l Dub Poetry fest. Kaie and his work have been featured on CBC radio, Zed TV, and Bravo TV. In '08 he was the subject of a short National Film Board doc titled ebon flow.